Restored building houses the MIT Department of Economics, MIT Sloan offices, and an expanded conference center. 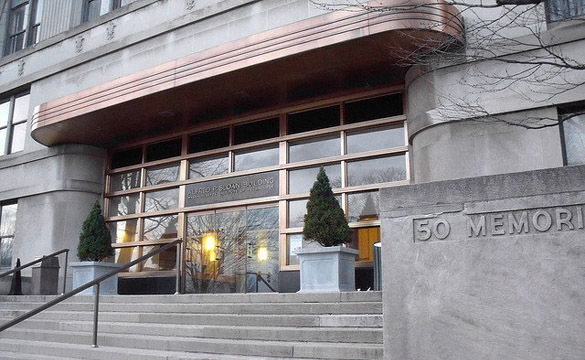 "The project to renew and renovate this handsome Art Deco-era building to meet our current and future education and research needs is a magnificent gift to MIT, and one that deeply supports our capacity to serve the world." The Morris and Sophie Chang Building, also known as Building E52, was formally dedicated on March 3, 2016. Morris Chang, SB ’52, SM ’53, ME ’55, and his wife Sophie, provided a gift that allowed for the building’s restoration and renovation. The historic art deco building re-opened in January following the two-and-half year project. The ceremony also acknowledged the building’s new Samberg Conference Center, named in honor of Arthur Samberg, SB ’62, and his wife Rebecca Samberg, and a light installation by Leo Villereal, funded by the Percent-for-Art project. More than 100 guests attended the festivities, among them the Changs, the Sambergs, members of the MIT Corporation, Cambridge city officials, MIT President L. Rafael Reif, Melissa Nobles, Kenan Sahin Dean of MIT-SHASS, and David Schmittlein, Dean of MIT Sloan.